I'm actually really proud of this because for some reason, it's just so tough for me to get these food posts out! I really don't want the frequency of posts on here to be a measure of how much I enjoy cooking (and eating) because it really wouldn't be an accurate assessment. For those who follow me on social media, particularly Instagram, you KNOW I cook often and enjoy doing so. I feel like there is something more interactive I could be doing with this section, but for the time being, recipes and food storytelling will have to do. I did a bit of research before cooking this. I've had a few experiences with venison over the years and not all of them have been great ones; the meat was so dry, I could have been eating French bread with no water in sight. It. was. BAD. As someone who's big on flavor and juiciness, I couldn't risk preparing a dry dish. So I considered actually marinating the burger for a few hours before preparing it. But in my research, I found that wasn't necessary; you can treat deer burger meat the same way you do beef burgers. I don't have time for teeny-tiny shoestring fries. Plus, who really likes that? After I cut these, I put them in the fridge for about an hour or so. 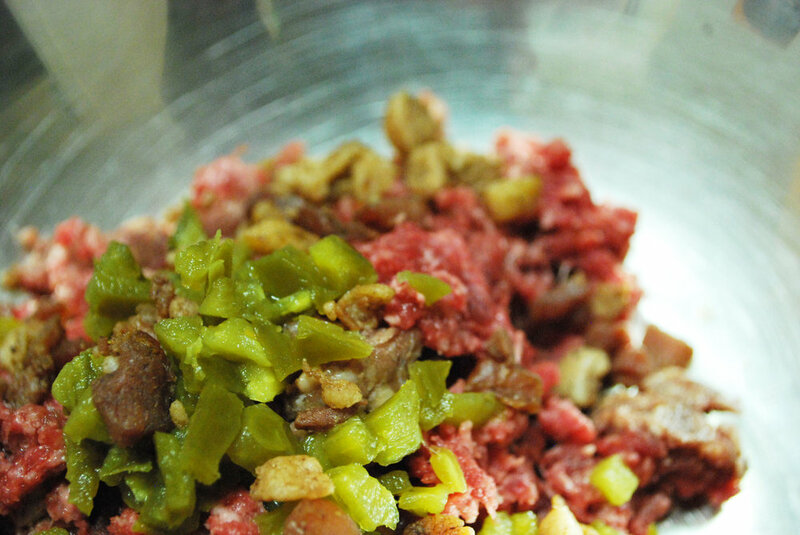 During this time, I added some diced jalapeño peppers (I had them in a jar) and some bacon bits to my thawed venison (aight, from this point forward, I'm referring to it as a deer meat). All I did was combine the meat, peppers and bacon together. After forming the patties (do I really need to explain this part? like, take the meat, make sure the ingredients are combined well and flatten), I used my trusty cast iron skillet to fry them. I have an electric stove, so medium heat works perfectly. Now, this is the time when I probably should have started cooking my fries; I have this thing about wanting all of my food elements to be done cooking around the same time. I get really annoyed when one thing is done, but I have to finish preparing something else (or other sides). Anyway, I had the burger going low and slow and decided to pull out my extras for it -- a lil' lettuce and onion (which I ended up sautéing with my burger). I really enjoy spicy food. The jalapeño simply wasn't enough for me. I had to add some habanero jack cheese, once my burger was about midway cooked. I'm big on melted cheese and medium-rare burgers, so you really have to watch the timing here. My suggestion is to just stand in the kitchen and watch your food -- keep your eye on it so you don't overcook. By now, the burger is nearly done and the onions are nicely sautéed. I took out my potatoes and made sure they were dried properly before placing them in some vegetable oil. I came across a lot of articles on making fries; some of them said to add flour for crispiness, partially cook them then dry, then cook again...all of these steps just seemed unnecessary to me, especially since I knew what I wanted. I wanted them golden, with a slight crunch and soft on the inside. This is how I imagine home fries should be. You can do what you like, but as for me and my house, this is how I like my fries. While the fries are going on medium-high for about 20 min. or so, I decided now was a good time to toast my bun. I LOVE toasted bread and it's very easy. I added some butter to the top and bottom pieces and put the oven on broil for about 5 min. Y'all. Please keep track of this. Otherwise, you will burn your bread. After the bun is toasted, you're in business! It's 'bout time to eat. I am not big on condiments, but I love BBQ sauce lol. In fact, BBQ bacon burgers are my favorite :). Rallys used to have one back in the day that was too good for words -- woo! For this one, I used Sweet Baby Ray's Chipotle Honey BBQ. Ugh! So. very. good. And it's available at Aldi, so for those on a budget like me, this is a win. That's it! I cut this bad boy in half and it was gone in about 20 min. For me, that's fast because I am a slow eater and drinker. I'm about experiences, so I like to savor things. 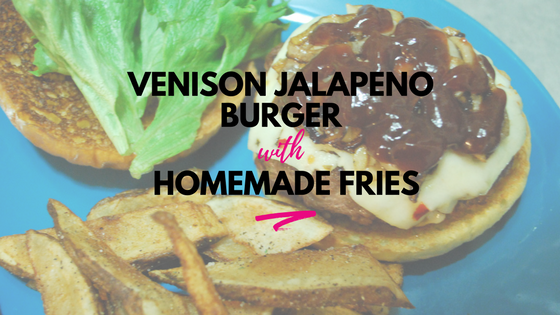 Combine all ingredients and create burger patties. On medium heat, cook burger for about 15, 20 min. (or until you're comfortable with the temperature). For the fries, cook in vegetable oil (or olive) for about 20 min. ; they should be soft on the inside, but a bit crunchy on the outside (again, my preference). After cooked, remove fries from grease, dry with a paper towel, then season with salt and pepper. Ladies and gents, you've got a $5 burger meal, with deer from the country of Tallahassee. Po' baby. All ingredients for this meal were purchased from Aldi; ok not all, but most.